Some stuttering at WOT runs smooth otherwise..
Coils and Plugs?? Or something else to check? 04 Turbo epl flash. bi-pass pipes. Enclosed is Porsche recommendation on spark plugs and service intervals for Cayenne S and Turbo. Edit: missed the part about when your plugs were last changed! Duh! You're well past due for spark plugs! It's not that bad of a job, I have faith in you! Maybe this video will help you out? Thanks, but it's always nice to have someone who has done it hold your hand. Ordered the coil packs and will pick up the plugs soon. I hear ya! Good luck with it! Since you're a former 928 owner this will be a walk in the park. As a heads up, the revisions on Porsche coil packs continues unabated. Regardless of what supplier you use, check with the dealer for the latest part number iteration. They change regularly as they try to improve the technology. The latest Turbo part number ends in a .14 suffix. I am not sure what the S models are up to, but IIRC its in the 20's... There are a lot of older coil packs floating around with discount suppliers, so keep that in mind. The 2nd set of failed coil packs I just pulled out of my 63k mile CTT were installed 5 years ago and only had 30k miles on them (rev .08). 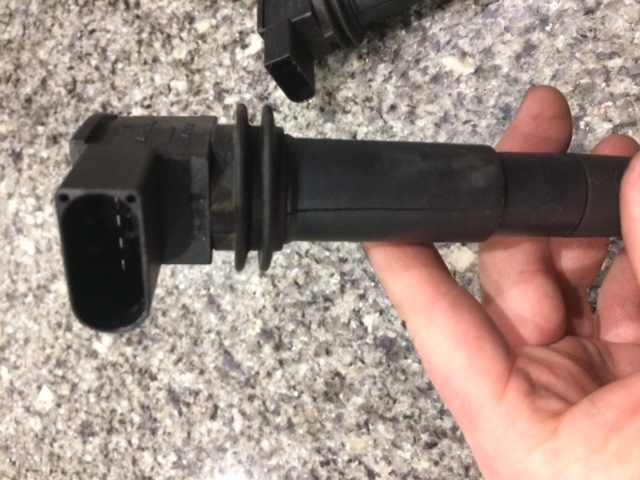 At this point, I have pretty much lost all faith in Porsche making a coil pack that will go the distance so this time around i'm buying whatever is cheapest with the understanding these are a regular service item. I just bought a set of 8 coil packs off of rockauto for $185 shipped and should have them Saturday. Below is what my cracked coil pack looked like. Quick Reply: Some stuttering at WOT runs smooth otherwise..